Many readers will associate Wales with their most dull childhood holidays; being lugged from castle to castle with Mum and Dad, being rained on during hikes, and being forced to pose for pictures when you felt like saying anything other than “Cheese”. However, many fail to realise that there is so much more to Wales than a couple of mountains and some old ruins. The country is home to a deep paranormal subculture and has produced many of the most terrifying yet fascinating ghost stories ever told. Wales’ status as a paranormal hotspot is not something which the tourism team focuses too much on, so many tourists remain unaware of the countless spirits which supposedly surround them during their stay. In this article, we’re going to try and balance things out by looking at some of the country’s most famous (or infamous) spots among paranormal enthusiasts and ghost hunters. Here are five of the most haunted places in Wales. The Skirrid Inn is a four and a half star public house located in the small Welsh village of Llanvihangel Crucorney. It is said to be one of the oldest pubs in Wales and has the ghosts and phantoms to prove it. According to legend, The Skirrid Inn was once used as a courtroom, and saw many men and women sentenced to death for petty crimes. Those who were found guilty were executed at the pub itself, and were hung from the well of the staircase. Many visitors to the inn, sometimes unaware of its grizzly past, have reported witnessing the disturbing apparition of a corpse dangling from the ceiling. There have also been many incidences of slammed doors, broken glasses, and assaulted guests. However, not all of the spirits at The Skirrid Inn are menacing ones. As one of the oldest public houses in the country, the building has been the scene of much jubilation and many happy memories. For that reason, it is no surprise that employees often report hearing laughter, music, and the clinking of glasses coming from rooms which prove to be empty upon inspection. 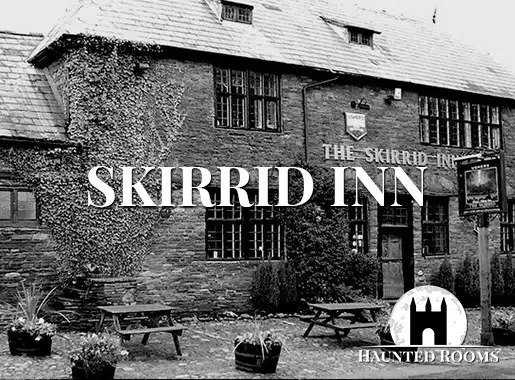 Haunted Rooms regularly stages overnight ghost hunts at The Skirrid Inn, so anybody hoping to encounter a ghost during their lifetime might just want to tag along. Whittington Castle is another reportedly haunted location at which we hold events, although some might find it a little more daunting than The Skirrid Inn. After almost a thousand years in existence, Whittington Castle is at the centre of almost as many legends and ghost stories. It is believed by some that the castle once housed the Holy Grail, though this obviously can’t be confirmed. There are hundreds of living people, however, who will support claims that the castle is indeed haunted. Centuries of battles and betrayals have left dozens of ghosts roaming the castle both inside and out, including a mysterious figure in a black cloak and hood who seems to guard the castle gates. Some visitors have encountered a phantom blacksmith, still in the leather apron which weighed him down during his earthly life. Perhaps the most frightening inhabitants of the castle are the numerous ghost children who are said to gaze from its windows, eying the tourists as they explore the grounds below. 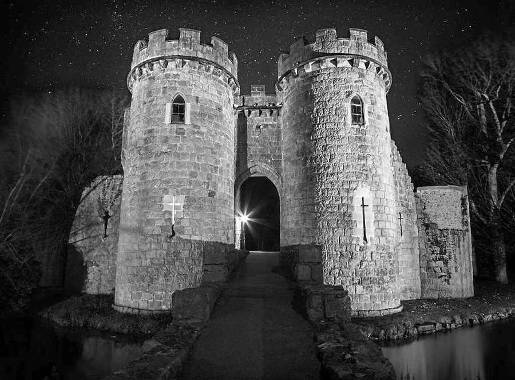 Children are scary enough when they’re alive, so a midnight visit to Whittington Castle is not for the faint of heart. 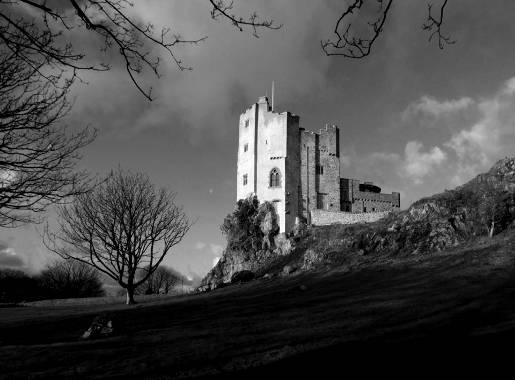 Roch Castle is said to be home to a number of spirits and otherworldly beings, and countless orbs and other minor paranormal activity have been reported. The tale of Roch Castle is steeped in mystery from the get-go, and the rumoured reason for the building of the castle may be stranger than anything which has transpired there in the past eleven centuries. According to legend, Adam de Rupe, the original owner of the castle, ordered it be built after a witch prophesied that he would die from a snake bite within a year. However, the witch also promised Rupe that he would go on to live a long and healthy life if he managed to make it through the year without being bitten. Rupe, determined to minimise his contact with venomous snakes, built Roch Castle and retired to its highest room, intending to stay there for the next 365 days. Weeks turned into months and the seasons passed with little activity. Though Rupe’s existence was boring, he found solace in the fact that he was still living, and spent his time planning his return to the outside world. Towards the end of the year, the winter weather made it difficult for Rupe to remain inside the castle, and so he sent a servant out for some wood so he could build a fire to warm himself. Unfortunately for Rupe, the wood had not been properly inspected and he wound up being bitten by a snake which had been lurking within a log. He died shortly after and it is believed his ghost still haunts the castle, with the greatest amount of activity being reported on the higher floors of the building. Among other reported ghosts is the spirit of a woman, presumed to be the daughter of a family who once inhabited the castle. She has been seen to float down the halls before disappearing without a trace. Nowadays, Roch Castle is owned by the Griffith-Rochs Foundation, and is a popular getaway for couples hoping for a romantic weekend together. However, getting some alone time may be a little bit more difficult than it seems. 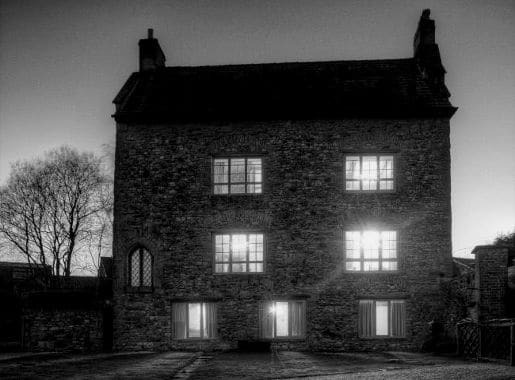 As well as being a pain in the neck to spell, Llanthony Secunda Manor is purported to be one of the most haunted locations in all of the United Kingdom. Originally built in the 12th century, the manor in its original state appeared a great deal different than it does today. 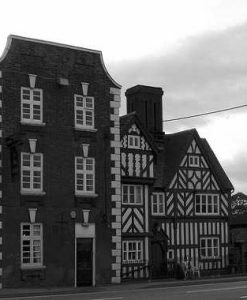 For the first few years of its existence, Llanthony Secunda Manor was used as a two-story grange by a monastery and was added on to as the years went by. As well as a number of extensions and remodelling, the manor has seen its fair share of owners. In fact, the manor once belonged to King Henry VIII, although most historians are skeptical that he ever actually visited the home.. The building fell into a state of disrepair towards the end of the 20th Century but was eventually purchased by an American lady who set about restoring it to its former glory. The manor is now a much lauded holiday home which has proven popular with travellers from all over the world, some aware of its paranormal reputation and some just hoping for a quiet place to stay. The building has been the site of much paranormal activity throughout its history, but recent developments to the property seem to have caused unexplainable occurrences to increase tenfold. Since the renovations, guests have reported their belongings being stolen or moved from one end of the room to the other. The chanting of monks has also been heard in various rooms throughout the manor. On top of this, there has been much poltergeist activity in the building, with many visitors being lightly touched or pushed by unseen entities. 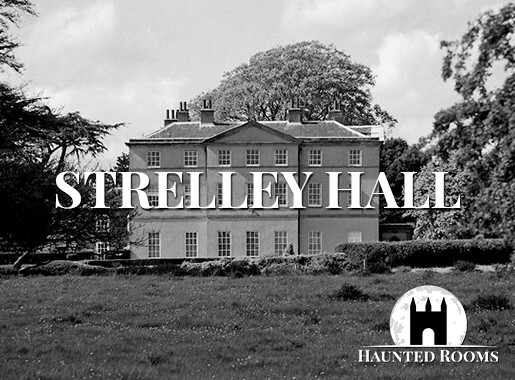 Anybody who wants to experience Llanthony Secunda Manor for themselves should head over to our Events section to see when Haunted Rooms will be holding their next event at the property. Sker House is another one of those buildings which was used to house monks during the beginning of the 1000s. When it was first built over 800 years ago, it was a single storey grange and was home to the Cistercian monks of Neath Abbey. In 1543, the monastery was dissolved and the property fell into the hands of Richard Williams, who subsequently sold it on to Christopher Tuberville. During the Tubervilles’ ownership, the property under went a number of drastic changes and two stories were added to the original grange. 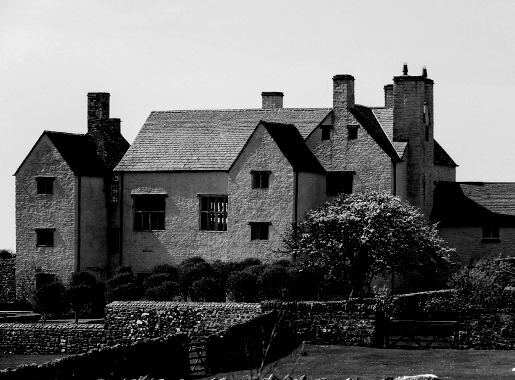 As we saw with Llathony Secunda Manor, major works on historical buildings seem to encourage paranormal activity, which would explain the multiple sightings of ghosts which have been coming out of Sker House for centuries. 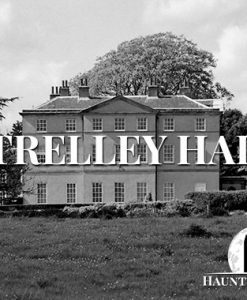 The most famous ghost of the manor did not begin to appear until after the Tuberville’s sold the property. In 1797, a man by the name of Isaac Williams began to let the house from its owner. Williams had two daughters, of whom he was extremely protective. Isaac’s daughter, Elizabeth, fell in love with a poor boy from the surrounding area and her father was infuriated to learn of their relationship. Though he forbade it, Elizabeth and Thomas continued to meet in secret and planned to elope together. When Isaac discovered their plans, he was so enraged that he locked his daughter in her bedroom and refused to set her free. She was finally permitted to leave when she agreed to marry a more respectable man from Neath and died of a broken heart a couple of years later. Since then, visitors to the property have reported an uneasy feeling the deeper they travel through the former grange. 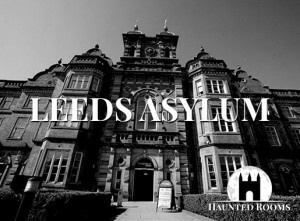 There have also been numerous sightings of shadows and dark figures, particularly within the room in which Elizabeth is said to have been locked up by her father. Many have also heard high pitched wails and cries coming from the room, presumably those of the young woman yearning for her freedom and true love. Some also believe that there is an evil presence lurking within Sker House, which is surprisingly common in buildings which were inhabited by religious orders.